Left Lane Associates Are Trucking Industry Experts Who Can Help You Transform & Grow Your Business! 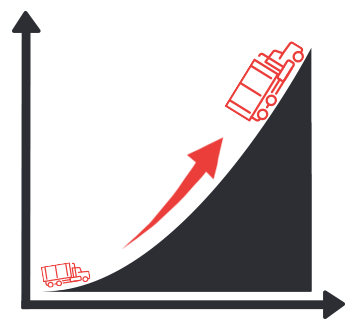 We are Proven Growth Mavericks who take a unique approach to helping you grow your trucking business (organically or through acquisition) or help to sell your business. At Left Lane Associates, our products reflect our out-of-the-box thinking and measurable solution-based philosophies. Helping set you apart from the heard is what we do best. ■ Products are all solution based. We are NOT hourly consultants. ■ Growth solutions are measurable and all fees are taken off future success fees if we are engaged to sell your company. ■ Utilize leading edge project management system software to eliminate cumbersome reports with streamlined reporting. ■ On buy and sell retainers, we work exclusively for one client ONLY in that space. No double dipping. ■ Templates LOI, Due Diligence and 100 day integration plan help increase the completion of a win-win deal with mitigating risk of deal fatigue. ■ War Room website and sophisticated proprietary CRM technology that manages who is hunting you (Hunter vs. the Hunted). ■ 7000+ industry social media presence allows us to get your message to interested buyers and sellers effectively and efficiently. Our sell retainer package is ideal for trucking business owners looking to sell their business & maximize profit! Our buy retainer is perfect for trucking business owners looking to expand their business via mergers & acquisitions. For those who want to get expert monthly mentoring & advice on how to continue to grow your trucking business! For those who want to get expert mentoring & advice on how to continue to grow your trucking business this is the package for you ! Mike McCarron is a known logistics industry keynote speaker and expert & provides entertaining out-of-the-box thinking while engaging the entire audience. Our CRM software is specifically geared towards the Canadian trucking & logistics industry & is a cloud based platform for all your CRM and marketing needs. Whether you want to sell your business – or just know you could – we will provide a customized 12 step plan to increase the value of your business. Web development & online strategy are areas you can target to improve your company profitability & valuation in a real way. Branding & design is often overlooked by the trucking industry but overlook it at your peril as good branding goes a long way!